We appear to be at a turning point not only for the dollar, but for all commodity markets, including precious metals, as well. The dollar has yet to reflect properly the enormous monetary expansion of recent years, and commodities will be corralled into supplying China’s Asian reformation. Taken together, the effect of a falling dollar and rising commodity prices, including energy, will drive price inflation upwards more violently than currently expected. This article looks at both these issues in turn. This month is the tenth anniversary of a sudden increase in reserve balances at the Fed. From August 2008 onwards, the Fed began buying assets from commercial banks, thereby injecting money conjured up out of thin air into the banking system. Before August 2008, total bank reserves rarely exceeded $10bn. Since then, bank reserves at the Fed increased to a staggering $2,786.9bn at the peak in January 2014. Between August 2008 and today, true money supply, a reflection of bank lending, has increased by just over ten trillion dollars, the equivalent of 65% of today’s private sector US GDP. It now stands at 100% of private sector GDP, representing an unprecedented growth in monetary inflation for any developed nation in modern times. It is still working its way into rising prices. However, an increase in the general level of prices appears to be the last thing on the minds of economists and investors. It is an odd paradox that price inflation is being ignored, spurred perhaps by the deliberate under-recording of it in official statistics. Behind it all appears to be an extreme fear that a global financial and economic meltdown is brewing, which will force foreigners to buy the dollar to cover dollar loans. But as I showed in two recent articles, this is a delusion, with speculators misunderstanding the true position. Furthermore, there are about $75 trillion of derivatives covering currency risk, so the idea that the currency world is a simplistic one with future currency risks unanticipated is simply nonsense. Foreigners are already up to their eyeballs in dollars anyway, having invested an estimated nine trillion dollars in US dollar assets since the Lehman crisis at the last count. Doubtless, portfolio flows have recently added to that in order to take advantage of higher US treasury bond yields than that obtained from German and Japanese sovereign debt. Furthermore, in addition to portfolio and commercial dollar investments, foreigners owned over $4 trillion of liquidity in correspondent banks at the last date of record. It almost certainly over $5 trillion today. Furthermore, with the annual budget deficit accelerating into trillion-dollar figures from the next financial year, trade deficits, despite Trump’s tariffs, are also on their way to similar numbers, unless the American consumer suddenly decides to start saving. That is unlikely. But fear of a financial crisis is not misplaced, but timing and form are the issues. There are two possible paths towards it, or perhaps a hybrid of the two. The Fed may be forced to raise interest rates to curb inflation more rapidly than is currently expected, in which case there will come a point where the interest cost of working capital fatally undermines established business calculations, leading to a conventional credit crisis. Alternatively, events may conspire to drive up stock markets into further overvaluation territory, as was the case in 1928-29, leading to a financial crash that directly undermines the US economy. Now that the US economy is awash with foreign-owned dollars, foreigners are more likely to turn sellers in a crisis and drive the dollar down than be further buyers over and above dollars accumulated through trade. This is markedly different from US and Japanese corporations covering their exposure to emerging market currencies, as was the case during the Asian crisis in the late 1990s, when they drove the dollar and yen up. Speculators take the precedent of a rising dollar leading to a new emerging market crisis so seriously that they have become incredibly myopic. They are not thinking through the consequences of a financial crisis for the dollar, otherwise they would not take out short positions in everything just to go long of it. It bears repeating that in the event of a financial crisis, central banks have one and only one response. They have a morbid fear of deflation, an ill-defined condition characterised by a fall in the general price level. They believe that a rise in the general price level is healthy and believe they can regulate it by reducing interest rates and injecting more money into the system. In other words, they always stand ready to flood the economy with yet more money. It is also worth pointing out that every bull market in equities is a wall of worry, and this one has been no different. Even after ten years of recovery from the last crisis, it is still conventional wisdom to worry about the euro and the Eurozone banking system. The imminent collapse of China’s economic miracle under a sea of debt is another often voiced concern. Now we have the collapse of the Turkish lira, the South African Rand, and the cross-infection into other vulnerable currencies. The slowing down of monetary growth accompanied by a flat yield curve in the bond markets is today’s favourite with monetarists, and we have been repeatedly warned about the overhang of unproductive debt. These are all issues that central banks can deal with, or do not really matter. Central banks are very good at smothering systemic risk and keeping the game going, as the bears should have learned over the last nine years. Over which time, incidentally, the S&P500 Index has tripled and is still breaking new high ground. The ending of almost all credit cycles occurs with unbridled optimism, and we are nowhere near that condition. When equity markets peak before the economy, usually due to rising interest rates, optimism is then to be found in the economy itself. If equity markets become wildly over-extended, as was the case in 1928-29 and 1999-2000, that is where the optimism lies and goes no further. In either case, we are emotionally not there yet. The global economy is probably growing more rapidly than recorded by government statistics. The best indicator we have is the developing shortages of skilled labour. That doesn’t mean that the Fed, for example, will get ahead of the curve and raise interest rates, sufficiently to head off price inflation. The members of its FOMC are equally infected with worries about the future as are the investing public, and, as history has repeatedly shown, they only raise rates reluctantly. We shall see, but these two separate paths into the immediate future, a wildly over-valued stock market or growing industrial optimism, will both lead to price inflation, measured in unbacked fiat dollars, irrespective of interest rates. A credit crisis is triggered not by the overload of debt as commonly thought, but by the rising cost of working capital and is the one risk wholly beyond the control of central banks. It is the principal risk created by the central banks themselves, a consequence of their expansion of money and the reduction of interest rates as a response to the previous crisis. The cycle of interventions has been getting more destabilising with every cycle, and every cycle ends with an interest-rate driven crisis. You do not have to be a slick hedge fund manager to understand that based on the massive expansion of the quantity of money over the last ten years, price inflation, not an ill-defined deflationary collapse, is what the future holds. The majority of professional investors are fixated on the latter as the immediate danger, which if anything, goes to show how distorted from reality markets have become. It’s not for nothing that western governments have begun to cosy up to African nations. Uhuru Kenyatta, Kenya’s president, spent some time at the White House earlier this week with his hand held out for American money, and Theresa May spent this week on a whistle-stop tour of South Africa, Nigeria, and then Kenya. African leaders probably hope for a return to the cold war, when they could play off one super-power against another, in return for bribes and funds to keep them in power. Today, it’s the West’s determination to clip China’s wings in Africa. China dominates infrastructure development south of the Sahara in order to access the commodities she needs for her own development and that planned for a new Asian super-state. Therefore, the central issue is access to commodities and energy and the American geopolitical imperative to obstruct it. The Western powers will not succeed in containing China in Africa, because she is actually providing employment. You would think our governments would learn from experience. No matter. This brings us to China. Earlier this month the leadership held a two-week meeting at Beidaihe, the beach resort in eastern Hebei province. It comes at a time when America is stepping up pressure on China in order to contain her influence. Doubtless Trump’s tariffs were on the agenda, but it is unlikely China will be deflected from her long-term strategy. This being the case, the Chinese approach continues to be one of damage limitation. In any event, US corporations have enormous investments in China, both in productive capacity and supply chains. China’s best course of action is to continue to exercise patience, and US business interests will probably undermine Trump’s trade policies against China from within. With that in mind, China is now handing out state contracts for infrastructure development. Having reduced domestic speculation in financial assets and commodities by squeezing out shadow banking activities, she is now easing credit conditions. In other words, the leadership is now moving ahead with its infrastructure development programme, despite trade wars. There can be little doubt that the recent weakness of base metal prices was driven in part by China’s clearing of the decks for her expansion plans. Western speculators then wrongly took this policy as evidence that China’s economy was in trouble, the victim of Trump’s trade war. This fuelled bullish speculation in the dollar and drove commodity prices even lower. Not only have Chinese-based speculators abandoned long positions in base metals, but international ones have as well. It has been a perfect storm, leading to a reduction in warehouse stocks everywhere. Copper is particularly exposed to rising Chinese demand, and experts in this market tell me that the lack of physical metal available for delivery from warehouse stocks, as opposed to recorded stocks, is unusual. Energy is probably the most vital of all industrial commodities, which China will need in increasing quantities, when shale-oil and non-OPEC production begins to decline in the next two or three years. My colleague, Stefan Wieler, who is a specialist in energy markets, has already covered this topic in Crude Oil – the Next 5 Years, published on the Goldmoney website. It is against this background that the gold price has become badly out of whack. The commitment of traders’ report for 21 August showed a staggering net short position of over 90,000 contracts for the hedge funds on Comex, otherwise known as the managed money category. 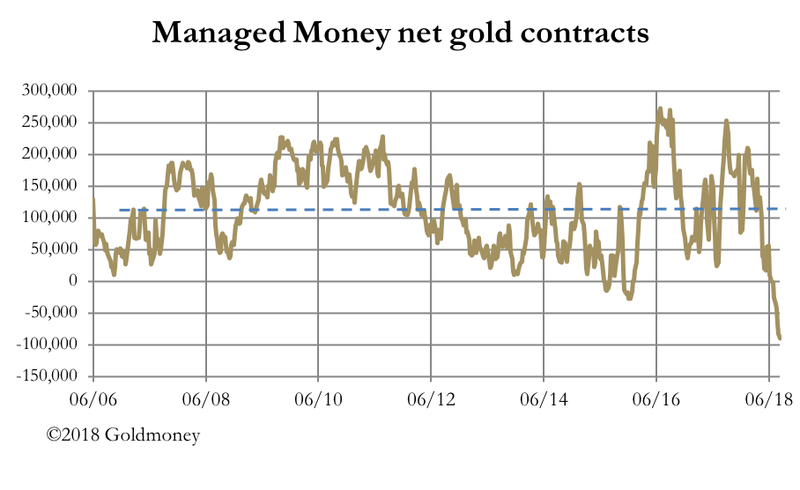 On previous oversold conditions, the last record was a net short position of 27,201 contracts on 29 December 2015, which was just after the low point at $1050, marking the beginning of a new bull phase for gold. The current net contract position is illustrated in the chart below. The pecked line is the average net position since 2006, which at 111,000 long is fully 200,000 contracts adrift from the recent net short level. This extraordinary figure will probably go down in the market history of speculative excesses, being not so much a disparagement of gold, more a measure of bull-headed bullishness for the dollar. 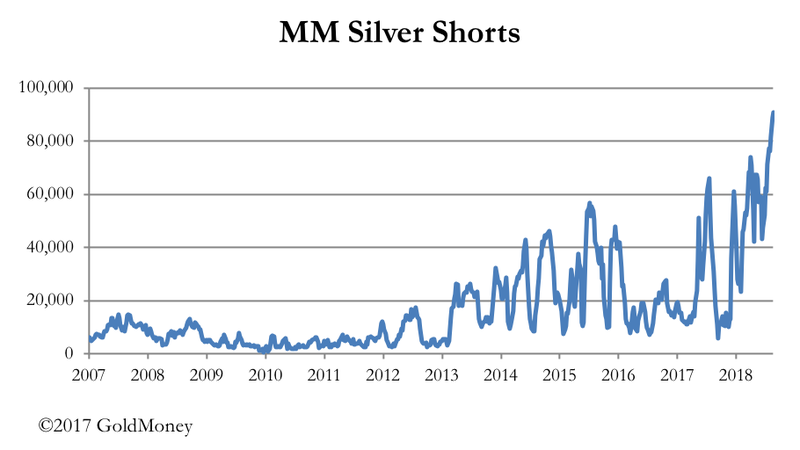 Furthermore, this was recorded after the price had recovered $35, suggesting that at its greatest depth the managed money category had been net short well over 100,000 contracts – that’s 311 tonnes of gold. It will of course correct. Bear squeezes commence when the gold price simply stops falling. So far, the price has rallied $40. But the commercial traders who are long of contracts are not registered charities: it is in their interests to screw the bears as hard as they can. Then, at some stage, the recovering gold price will be seen by the hedge funds as a way to short the dollar. We know this because that is the Comex playbook, repeated time after time. While traders have focused on trends, they have missed the bigger picture. Russia, which happens to be the world’s largest energy supplier, is ditching the dollar in favour of gold. As the Deputy First Governor of Russia’s central bank said, “gold is a 100% guarantee from legal and political risks”. Russia is not alone. Asian countries, whose nationals still regard gold as the ultimate money share this view, and the more America uses the dollar as a financial weapon the more they are moving to ditch it. There is as yet no stable and credible paper currency replacement. That may or may not evolve in time. But there is no doubt that any Asian nation looking to the future benefits from China’s continent-wide development plans needs to find one to counter the risk of American interference. Gold is the only commonly accepted alternative to American hegemony, and if the dollar declines from its current overvalued status, the attractions of gold as the cross-border trade medium can only be enhanced. It is clear that the Americans want to stop China’s influence developing and spreading. Unfortunately for America, China holds almost all the valuable cards, and together with Russia, she is on course to eliminate American influence not only in Asia, but to reduce her influence over the commodity-producing nations in both Africa and South America as well. President Trump has also alienated the Europeans and Canada, where the Trudeaus claim a special relationship with the Chinese leadership. Japan is politically allied to America, but commercially she jumped ship some time ago. As the dollar weakens, we can expect these topics to come to the fore. Unless he backs down on trade issues after the mid-term elections, President Trump’s threats over trade tariffs will only serve to weaken American multinationals with Asian supply chains, raise domestic prices, thereby forcing up the pace of price inflation, and destroy American jobs. The only positive going for the dollar will be the rise in interest rates, as the Fed grapples with price inflation moving above its target, in an economy stimulated by increasing budget deficits. But it is likely to be a positive that only feeds weakness, as US Treasury prices fall stimulating portfolio outflows, and potentially leading to a government funding crisis. So far as gold is concerned, anti-dollar sentiment can only grow. The deeply oversold conditions in the futures markets are therefore consistent with a major turning point. Perhaps that is what we have just seen. If gold is going to rally and enter a new bull phase, we can expect silver to benefit as well, traditionally moving nearly twice as much as gold. The hedge fund short positions have rocketed, as shown in the chart below. However, hedge fund exposure to long contracts has held up somewhat, leading to a net short position of 27,717 contracts, extremely oversold, but not a record. The difference from gold is silver is predominantly a commercially consumed metal, with a legacy of being a monetary one. The prospects for the silver price are therefore substantially set by industrial demand. However, out of identified demand last year totalling 31,652 tonnes, coins and bars absorbed 4,699 tonnes, to which we can add jewellery at 6,503 tonnes and possibly include silverware at 1,817. The relevance of jewellery and silverware is Asian demand, particularly from India, then China and other S.E. Asian countries accounted for 5,670 tonnes. Silver in these categories is seen by these peoples to have long-term investment and monetary value. Therefore, investment and quasi-investment demand for silver accounts for up to 41% of the total, the rest being industrial. Total supply appears to be tight, at 1,094 tonnes less than total demand, meaning that any increase in industrial or investment demand could have a dramatic effect on the silver price. These figures help explain why the silver price is more volatile than that of gold. But there is a further interesting consideration, and that is the Chinese government classifies silver as a precious metal, the responsibility of the People’s Bank. What that means is China’s central bank overseas 7% of global demand, and as with gold, the state has the refining monopoly. While industrial demand has softened in recent years (having peaked in 2013), it is likely to pick up in the coming years, as China brings more of her population into the middle classes and expands her markets in Asia. As is the case with base metals it’s hard to see how mine supply can expand rapidly enough to meet the likely increase in demand. Therefore, the two factors driving future prices are likely to be an immediate shortage of physical metal as China restocks for her industrial demand, and the fall in an over-valued dollar stimulates investment demand. It is clear that recent dollar strength has been driven mainly by speculative flows on the assumption that the Fed’s interest rate policy, coupled with Trump’s trade policies, will create a credit crisis leading to demand for the dollar. While a credit crisis is inevitable, market assumptions are wrong for two reasons: foreign ownership of dollar cash and dollar investments are at an all-time record already, and the Fed will do everything it can to avoid such a crisis occurring. Meanwhile, China’s economic planning continues regardless, and will lead to a massive increase in demand for energy, base metals and other industrial resources over the coming years. That process is starting now. The outlook for the dollar is therefore extremely bearish. Its purchasing power measured in commodity prices will fall, its relevance as a trade settlement currency will decline, and the excess deposit money in the US financial system will continue to work its way into rising domestic prices. Furthermore, when the credit crisis actually hits US financial markets, the only response the Fed can have is to flood markets with yet more money. The confluence of current events and their prospective development appear to be extremely positive for precious metal prices.